We are beginning to look at different artists and styles of artwork from around the world. This has been a lead on from our Olympic study. To motivate the students and to generate ideas we watched this short movie. It was very clear and concise and gave simple instructions on techniques etc. 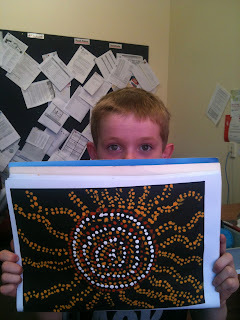 This website has some fantastic examples of Aboriginal art as well. These are the initial drafts that the students did to practice technique, using paint and just for discovering. Our focus was to use the correct technique and earthy colors. Dean and his sun pattern. Maya and her funky lines and smiling sun. Day 1 of students own Aboriginal art idea. Some have created their own patterns and others have used Australian animals as their focus. Dean has chosen to do an Echidna. Background work to come. 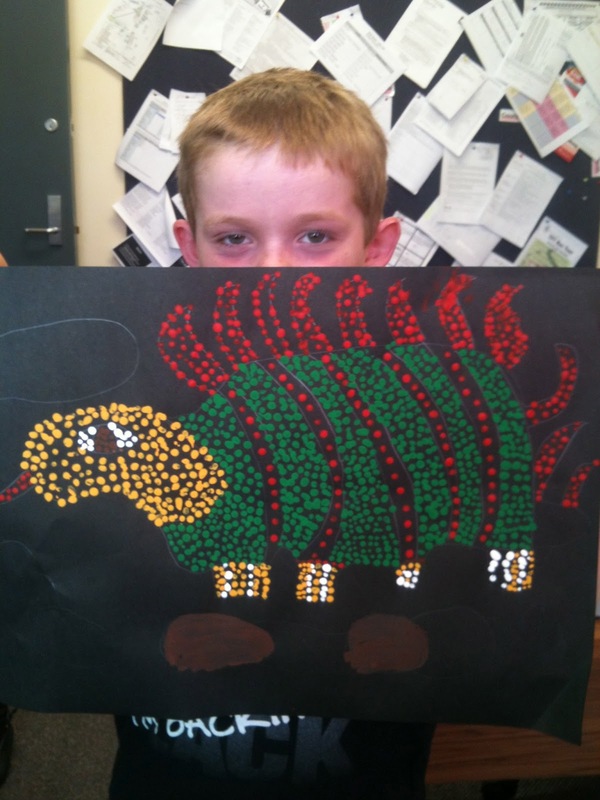 Mikayla has used patterns and earthy colours to produce this fantastic patterned piece. Almost finished. Maya is using a huge range of techniques to incorporate patterns and a snake in her design. Background work will finish this piece off.